We love our new Roll Top desk. It fits perfectly as you can see in our new home. The quality and construction is great and we are busy filling all the little drawers now. Thank you Jane for your customer service and communication through ordering, shipping and tracking our desk. 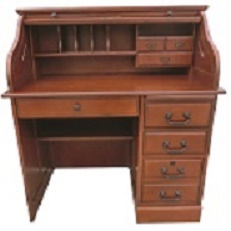 We highly recommend Country Marketplace to purchase a roll top desk. White Glove Driver delivered and assembled my desk. Did a great job!! Can't wait to hang it on my wall! I received my wood sign today and I love it. Can't wait to take it up north and hang it on the wall next week . I have even told several of my friends about your site and I am sure that I will place another order in the future. Thanks for working with me on this. 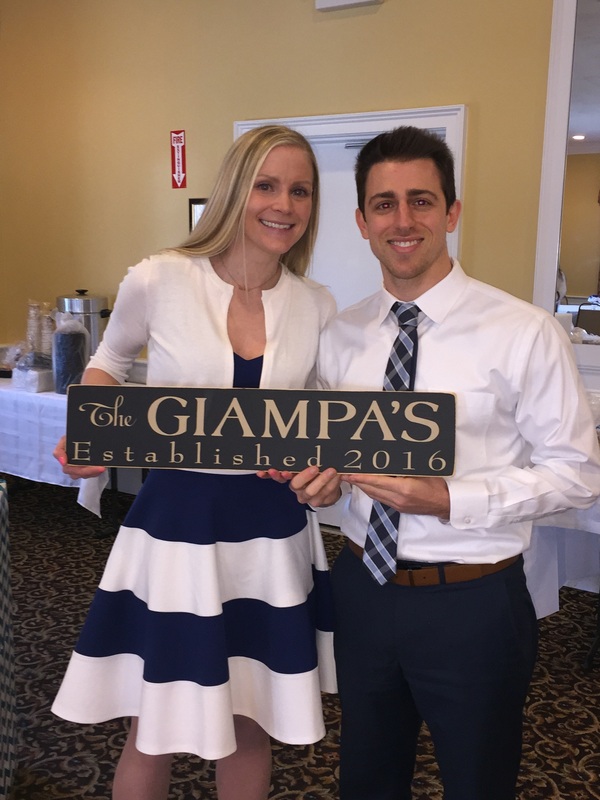 This sign was the hit of my niece's Bridal Shower - such a warm and personal touch. They absolutely loved it and plan to feature it on the entrance table at their May wedding. The new desk is fabulous! It fits in the room perfectly. There is an indentation in the wall of my living room and this desk fits in there as if the cutout was meant for it! I have been using this desk every day since it arrived (I'm busy doing tax returns for family and friends.) My son had no trouble putting it together. Thank you for all your help! I am a happy customer! 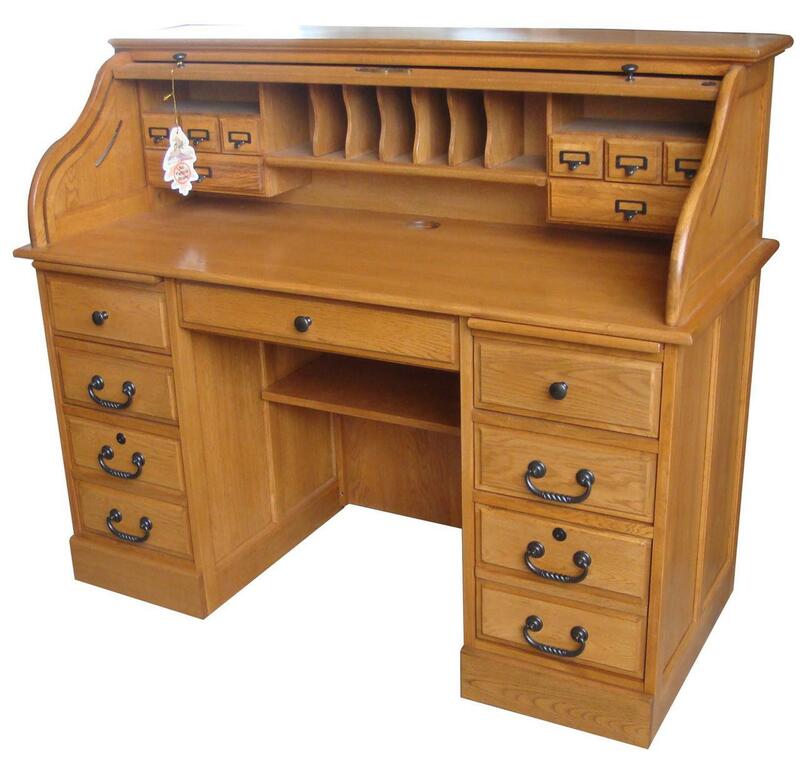 This solid Oak desk stands up to its description! It is absolutely one of the best pieces of furniture I have ever bought! I will definitely buy here again. Thank you for making such a quality, well built product! I wanted to thank you again for your help with my roll top desk order. It came as you said it would and we are very pleased with the purchase. You and Susan were attentive, polite, patient and professional. I purchased this desk for my Mother. She received the desk yesterday. The driver was very friendly and polite. She put it together by herself and it looks beautiful. We agree! 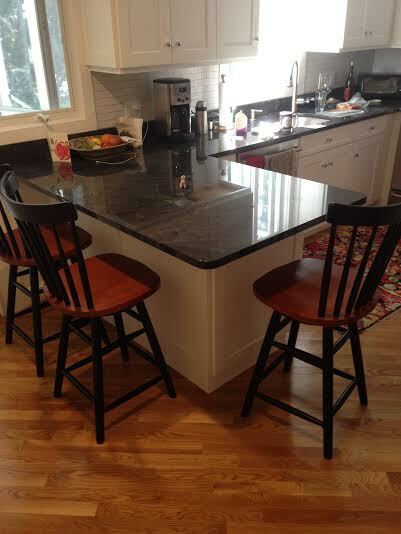 These swivel barstools look so much better in your home than in our store! 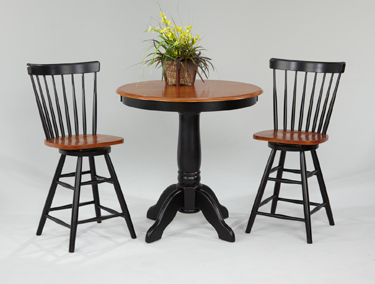 Curved Back Swivel Barstoools 24" height - perfect for 36"counters and islands. Mom and I waited for the 54” Executive Roll-Top Desk delivery with much apprehension because it went against our better judgment to purchase an expensive item online without seeing it in person. Jane went above and beyond, taking photos of the desk in the store and e-mailing them. 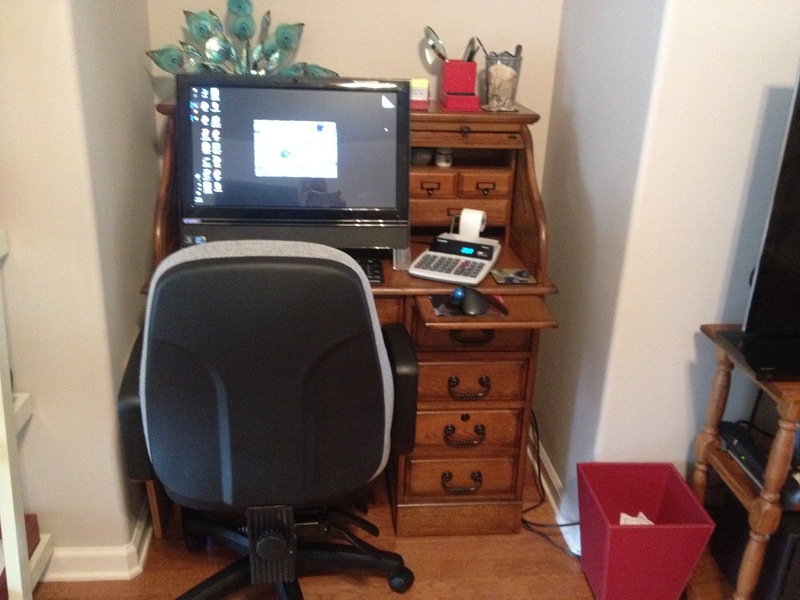 Thank you, Jane and Country MarketPlace, for our desk that screams HEIRLOOM!! Very happy with the desk. Arrived in perfect shape. 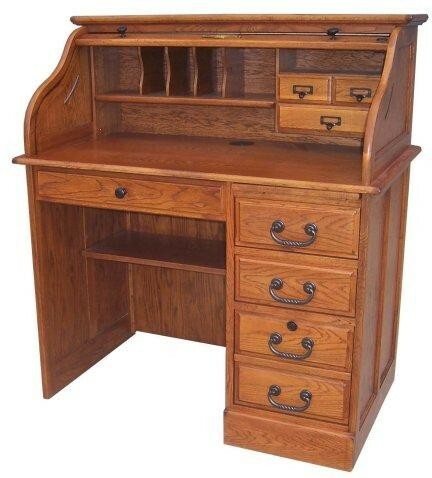 Great desk with plenty of storage. The desk is built very well, looks great in my den and holds so much. Exactly what I was hoping for. I first saw this roll top desk model almost 30 years ago and ever since then, I have always held it in my mind as an: "I-gotta-have-it" item. I absolutely can't BELIEVE I have waited this long to 'pull the trigger' and get it!!! I couldn't be happier!! With all of the numerous drawers and storage capacity of this desk, I'm finally able to organize all of the items and files that I never had enough room for before. Now I have everything in its place. Perfect!! Pleased to buy goods Made in the USA!!! I was very delighted with the purchase. I especially appreciated the thank you from the company. It is nice to know that companies realize consumers have a choice. Knowing that your choice is appreciated is especially gratifying at this time. Great sign, high quality, fair price. I was browsing for a message sign for my wife. I found Country Marketplaces! So glad I did. I bought 2 signs. I loved the hand written note inside! The ornament is perfect. Great quality, great price and love the customization. Would definitely recommend! I was a bit worried that this wooden sign would be some cheap import and not worth the money I spent on it--I WAS 100% WRONG! It is well made and I know my wife will love it. FAST delivery and GREAT quality--THANKS! I will for sure be ordering from you guys again! I have been looking for this sign for a long time and just thrilled to find it! Very nice quality, packaged very well. Thank you Country Marketplace! Very nice quality and it arrived well packaged and in perfect condition. Ordered this sign in "Antique White" and it is beautiful. It is a gift for a new mom who now has 2 boys. I was thrilled when I received this in the mail, because it's even more beautiful in person than it was online! The quality and workmanship is excellent! I would recommend this site to anyone who was interested in enhancing their home with something like this. 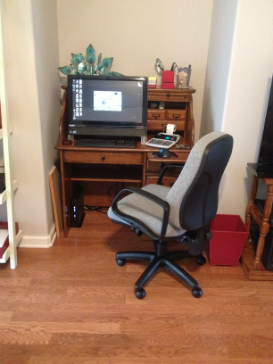 I recently received my roll top desk and I was very happy with the solid construction (no particle board).It's a handsome piece of furniture and well thought out in it's design with innovative ways to compartmentalize items in the desk and ample storage space for a 54" piece. I would highly recommend this desk. What a great experience we had buying our new Kitchen set. Jane was so helpful and the quality was top notch. 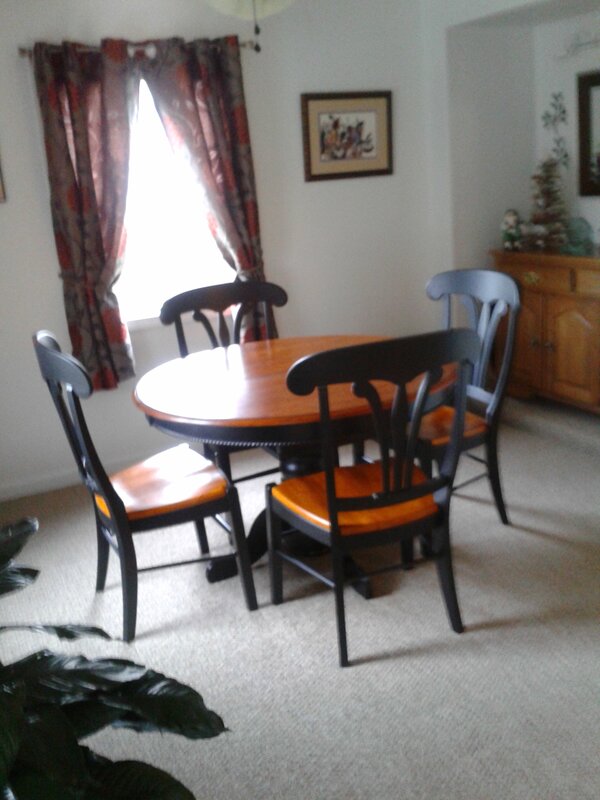 We actually had purchased a kitchen set from a large retailer after seeing the quality and products at Country Market Place we cancelled our order with the large furniture retailer and bought this great set at Country Market place very fair prices and they back up their price with great customer satisfaction. 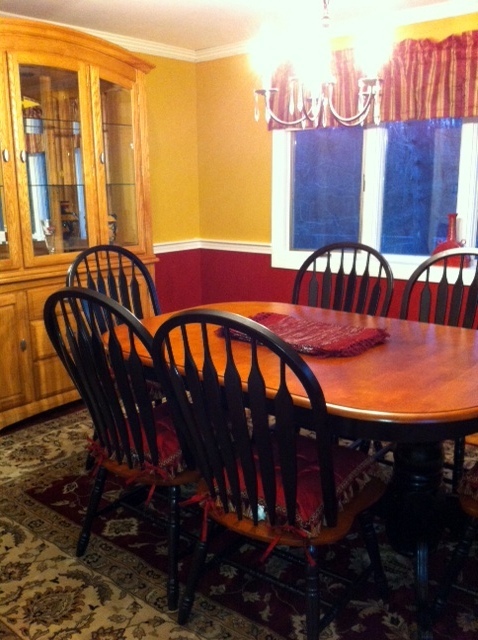 Thanks so much again for your help putting together our dining room set! 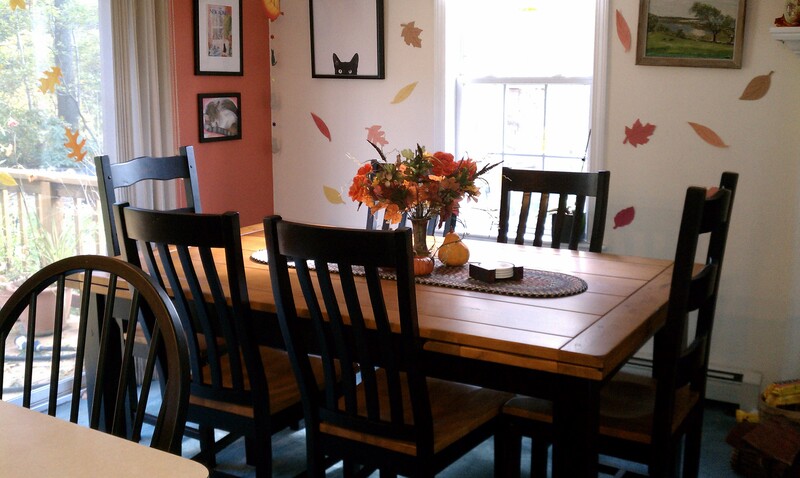 Still need curtains but the table and chairs look great!!! "We love it! Certainly you may add the picture! Again, we love it! We had a party and quite a few people commented on it. They asked where we got it and I told them I built it. Haha. Then I told them the real truth. Hope to see you guys soon. " Awesome! Beautiful. "And Aubrey is her name". 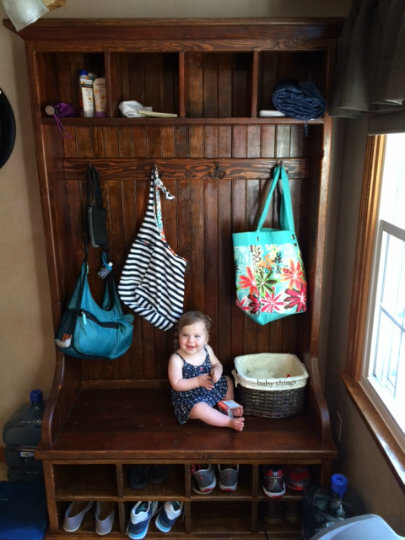 Happily hanging out on her new Georgetown Mudroom Organizer that her parents purchased for her at Country Marketplace! 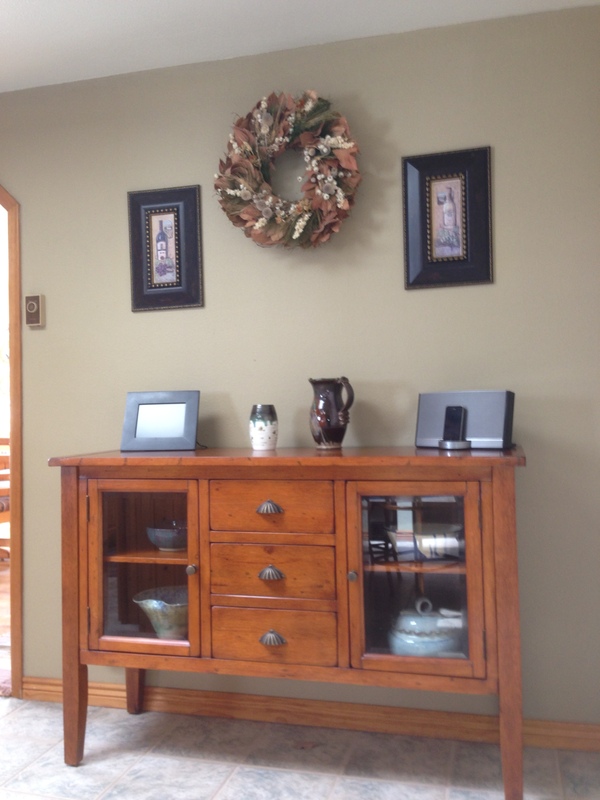 Crafted according to their specifications-- the entryway is transformed. It stores it all: diaper bags; sunscreen; beach towels; umbrellas; sneakers etc. Everyone’s happy! Beauty & function. Proudly Built in the USA Each piece of our Georgetown Collection is crafted according to your own specifications/dimensions-- using 80-200 year old reclaimed lumber. Stop by and we will design an "instant antique" for you! Thank you so much for all of your help in creating the perfect Mother's Day gift for my mom. The custom wood sign came out wonderful. Casey T.
We had an excellent experience at your Braintree Store, thanks in large part to your salesperson, Kasey. Not only were we able to purchase exactly what we were looking for, but we received excellent service thanks to Kasey. She made sure that the stools purchased were in mint condition, and even made sure that they were well protected when placed in our car. She then stopped traffic to allowed me to exit the loading dock safely. This level of service is rarely seen in this day and age. Thank you Kasey! You can be sure that we will be telling friends about your store and about Kasey, and will be back in the future. Kasey in the Braintree store was by far one of the best shopping experiences I ever had. Very friendly, not pressured, felt like she really cared about me being happy with the table I purchased. I actually left the store, went to one of the "big chains" who had a similar table for less but decided to go BACK to Kasey just because I didn't want to buy it from anyone else. I will go to Country Marketplace first for any other home needs because of how she worked with me. 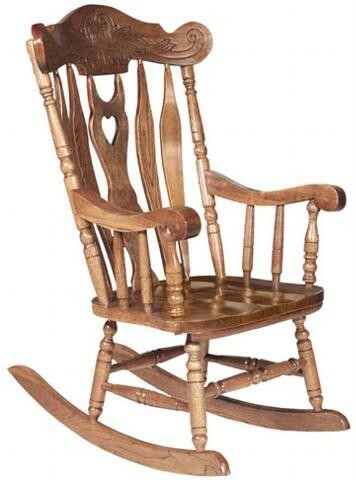 This rocking chair is not only beautiful to look at, it is also comfortable to sit and rock in. The rocker practically hugs you. This is a solid, beautifully crafted piece of furniture, worthy of becoming an heirloom to pass down to future generations. And these signs are the perfect gift to celebrate or commemorate a trip to Fenway Park. I'm giving the signs as surprise for two dear friends as the three of us are meeting up in June for a trip to Boston and Fenway Park. Love the signs. Thank you! This desk is absolutely gorgeous. 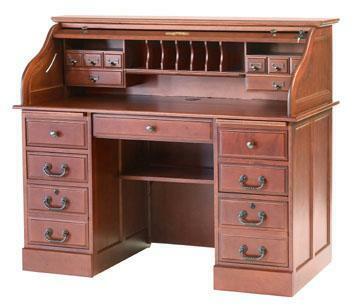 It's solid wood, the color is unbelievably beautiful and true to the color it shows in the picture of the desk. I can't say enough good things about this piece of furniture. Something I will pass down to future generations in our family. I love, love, love it. Also the customer service is the best ever. The piece is absolutely perfect & beautiful! For fun I've attached before and after pics.....Lovely, simply lovely. You and your company were a delight to do business because of your personal touch and just overall great shopping experience. Just wanted to let you know the lamp arrived and it was just what I was hoping it would be. Fits perfect for where I wanted it. My husband has been bed ridden with Parkingstons for almost 6 years and I need to have a small light on at night. We had converted the dinning room into a room for him . I have the lamp in the kitchen which he will be able to see from his hospital bed. This is probably more information the you want to know but thanks again for all your help. I just wanted to thank you again for finding the sign! I picked it up tonight and it’s perfect for our new home. This is the perfect table for us. It looks great in our home. 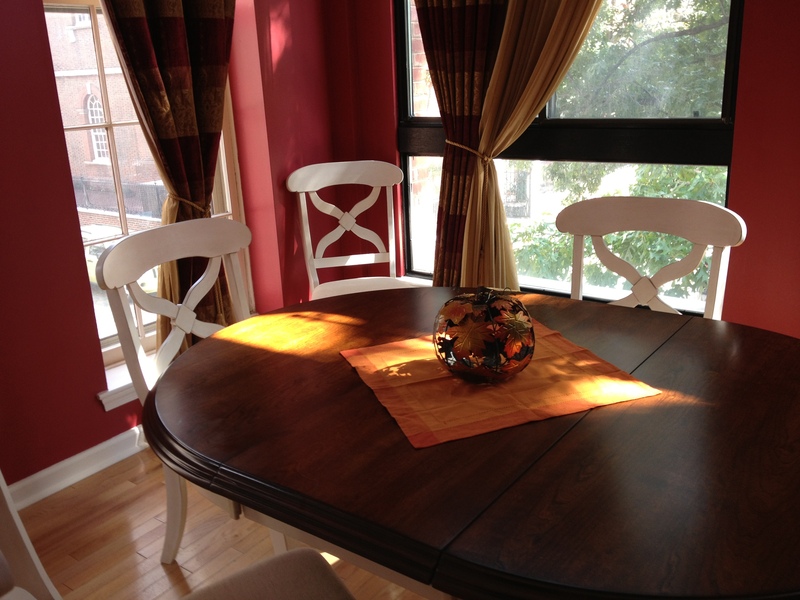 The feature we like the most is the self-storing leaves that hide inside the table and are so easy to put up in place. It was "piece of cake" to assemble. We can't wait to gather our family and show it off soon. Thanks for all your help. I love this sign! It reminds me of home. 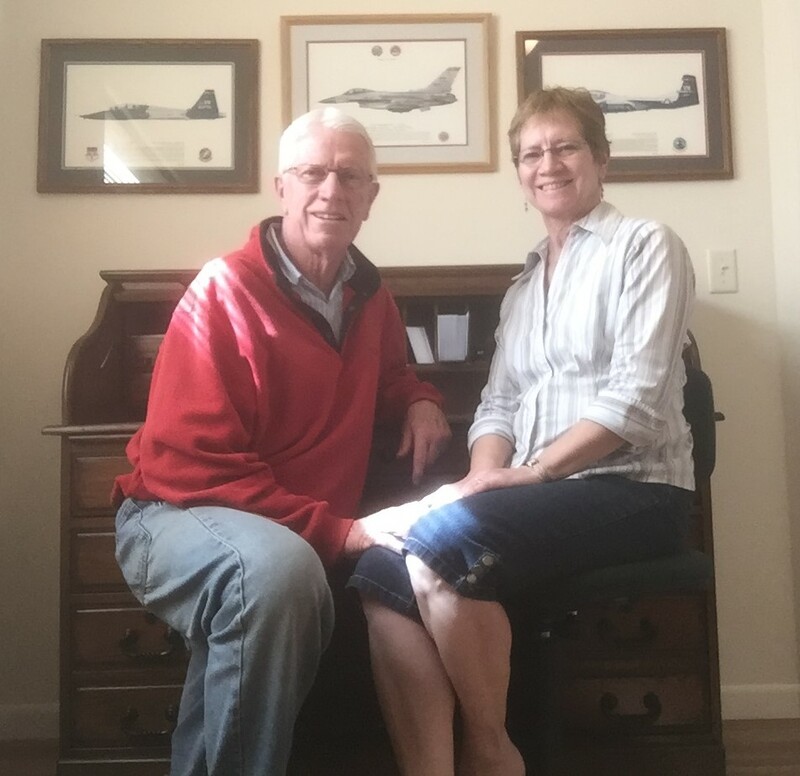 I am from Massachusetts, I lived there for 23 years before joining the USAF. I am stationed in Texas and this sign brings a little piece of home to me. Great product! And my husband can attest to this sign being 100% true! Haha. After waiting patiently for our delivery to Philadelphia, we must admit that our new set looks lovely especially in the morning light with these beautiful windows. Thank you. 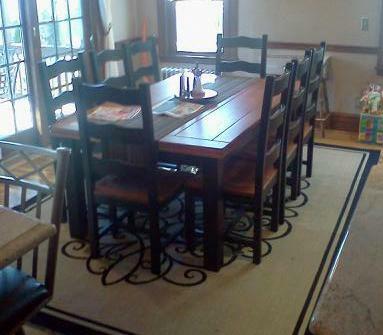 Donna R.
Here is a picture of my oak harvest table. As you can see we mixed slatback chairs and Ladderback Chairs on the end for a more interesting look We just purchased the Red Cabinet at the Kingston store that helped finish the room. Thank you. 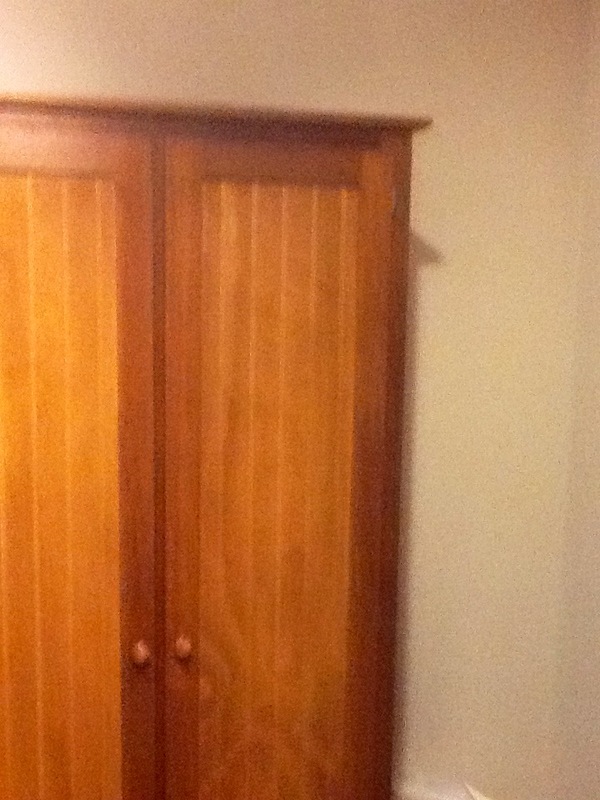 My new Linen Pantry is perfect for my home. Just the right color and it fits everything I wanted and needed to store in it. The young man, John, who delivered it was a gentleman and so polite and considerate. 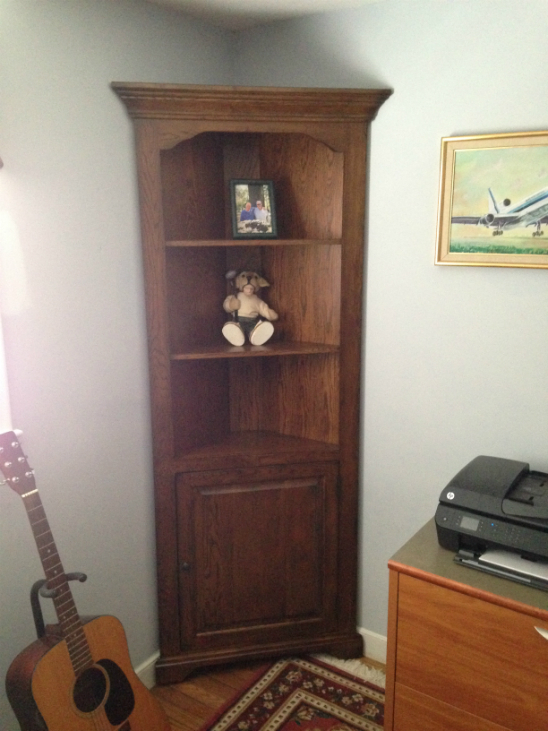 This piece of furniture was well worth the wait for such finely crafted solid wood cabinetry. Thank you. I loved that I wasn't limited to the number of letters and spaces like other companies that are selling the same throw. The communication with Country Marketplace was prompt and easy. I had ordered this rocking horse from two other places and kept getting my order cancelled because they were oversold. I called Country Marketplace as a last resort and the gal who answered the phone was just the best! She guided me to the right model for the kid's age and then pulled their last one off the floor for us. It shipped fast and the little girl's reaction was priceless! Squeals of joy were heard for miles! She adores it and carries it all over the house so she can sit on it all the time. Thanks Country Marketplace and your super nice staff! Just wanted to say again 'Thank You' so very much for your expertise, help & guidance. 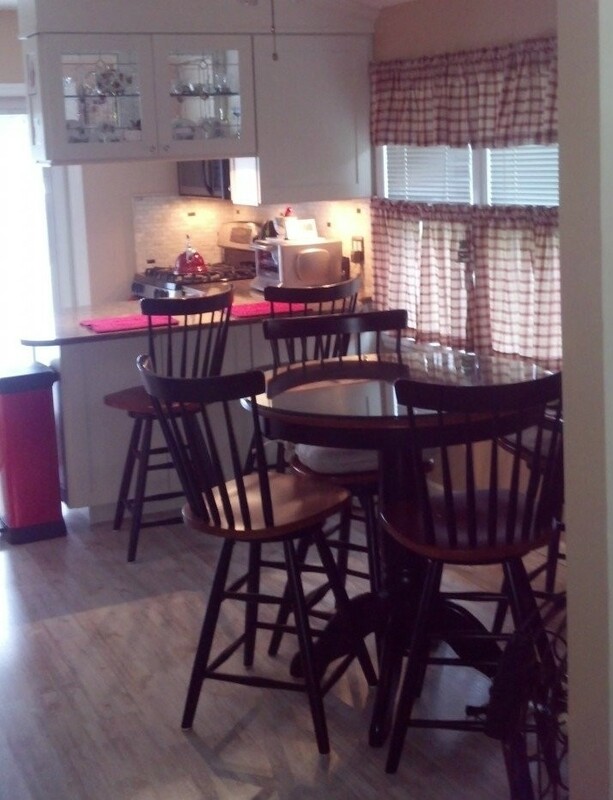 The new table& swivel stools are perfect in the kitchen. Why did I wait so long and look @ some many tables? Your selection is outstanding. 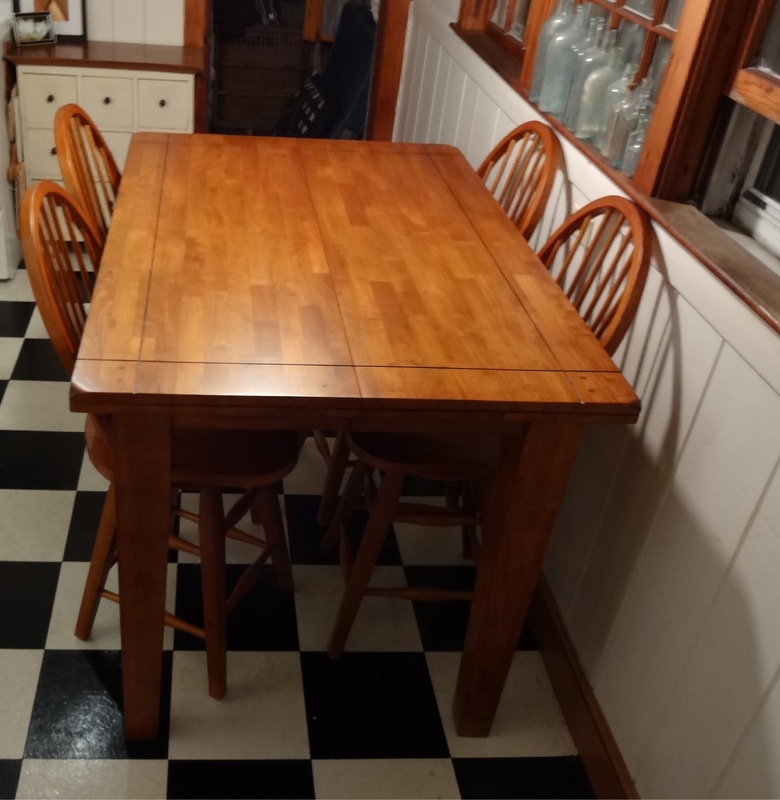 The table is solid, well crafted and the fact that it has a hidden leaf built in-- to expand to 36" square for extra space & seating is exceptional! 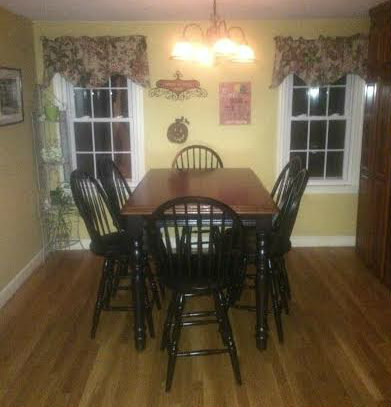 I may be in soon to order 2-4 black saddle stools to accommodate seating for 8 people. I'm now looking @ your selection of hutches/cabinets.Your customer service is wonderful. 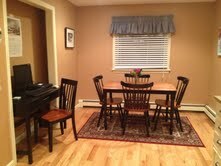 Plus, when the table was delivered, Dan assembled& built the new table with care and precision. It has been a pleasure-- so glad to have found you!!! 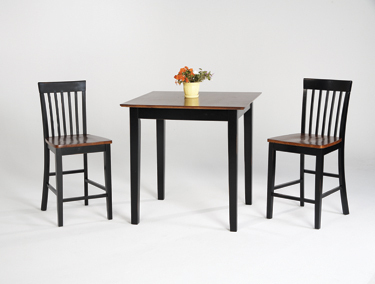 We just love EVERYTHING about this table and chair set! 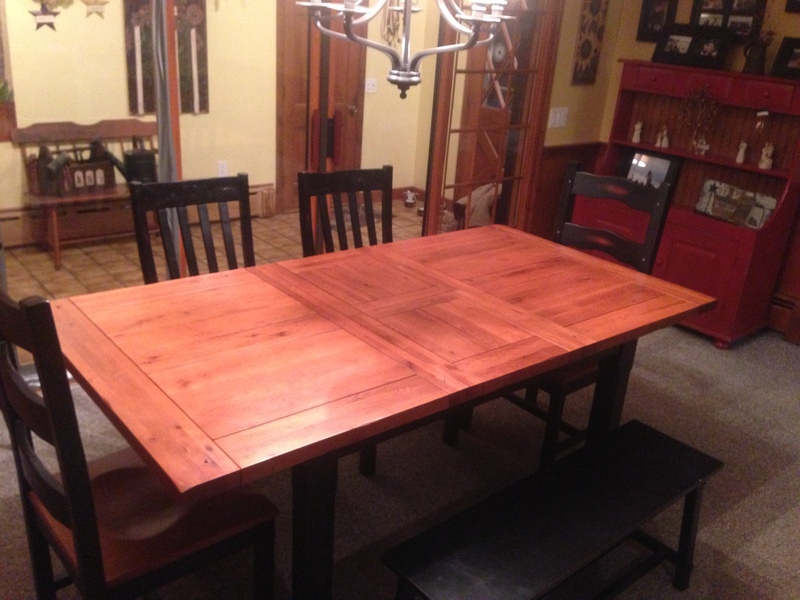 Thank you so much for your help with the purchase of the dropleaf table. I have to tell you, it is perfect! As you will see by this picture, my bulldog also was happy with it! She has been laying under it since it came through the door. It went perfect in my primitive kitchen and my chairs were a great match. Thank you again and I will be recommending your shop to everyone I know. 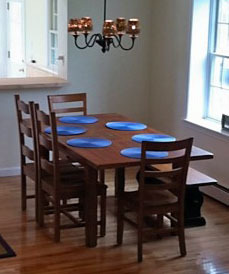 "The place really turned out perfect and the dining room set you helped us out with really brought everything together. The quality of the furniture was outstanding. My builder even commented on how heavy and sturdy the chairs were when it was delivered. I enjoyed my experience with you and would recommend The Country Marketplace to any friend or family member over anyone else! I look forward to dinner already!" 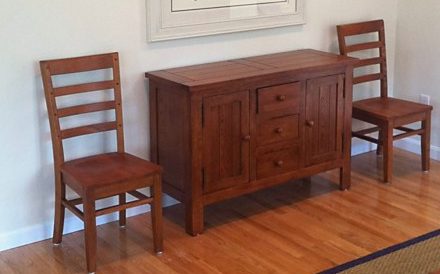 A well-crafted, wonderfully functional & beautiful peice of furniture ! Could not be happier with this console. We spent much time at the "major" furniture stores searching high & low for a quality corner media unit that provided the storage we needed as well as one that looked like a quality, well-crafted peice of furniture. The quality of this piece is unmatched by any offered at the "major" stores we went to. In addition, the customer service @ Country Marketplace is unsurpassed ! You will not be disappointed. 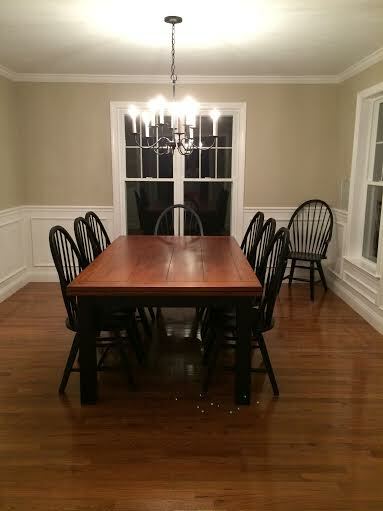 "Thanks for all your help with suggestions and guidance in finding chairs to coordinate with our table. We love them!" Hi, my name is Kristin and I am 9 years old. Santa brought me a bed that was too high for our ceilings. We found an even better one at Country Marketplace and they were able to deliver it the same day! I LOVE MY NEW BED!!!!!!!!!!!!!!!!!!!!!! It is so cool... it has tons of storage space in the drawers underneath and I made the bed look so stylish by hanging Justice beads from the "ceiling". I am a very satisfied customer and would highly recommend the bed and the outstanding help and service we received at Country Marketplace! This is me looking at the bed in the store and the bed in my room... I am hiding under the blankets! I have a lot of blankets, pillows and stuffed animals on my bed! My kitchen is almost finished! 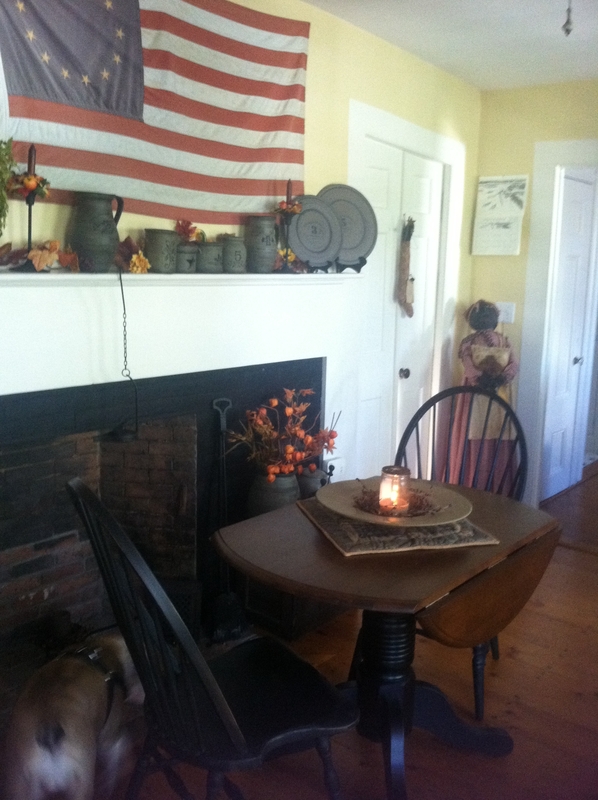 I love my furniture from The Country Marketplace. It is great quality and looks super in my kitchen. Thank you so much for all your help. I will be back again as soon as I start renovating my next room!